The Louisiana Department of Wildlife and Fisheries (LDWF) has a Nuisance Alligator Program which receives over 2,200 calls annually with complaints about problem alligators. These complaints are given to the 65 alligator hunters who are licensed to harvest them or relocate them. Only smaller alligators are relocated and around 3,000 nuisance alligators are killed each year when it is determined that the alligators have become dangerous to humans, pets or livestock.. The mere fact that you see an alligator in an unexpected place is not considered a nuisance alligator. Alligators are sometimes just moving around and will go about their way if left alone. It is when they become a threat to people, their pets or livestock that you need to take action. Most visible alligators are the smaller ones who have been pushed out of their birth habitat by larger alligators. They are often looking for a new home or a new mate and will usually mosey on their way if left alone. LDWF suggests that you give them as much time as you can for them to move on before calling in a complaint. Remember that if you hear hissing then you are much too close to the alligator. It’s their way of letting you know they are getting upset with you. In general they are afraid of humans and will most often retreat. 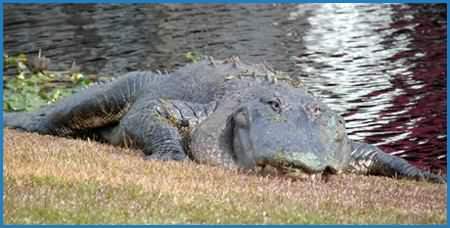 If you happen upon a ‘gator’ it is advised that you slowly back up. Even though they can run as fast as 35 mph., they do not usually charge at humans with the exception being Momma Gators who charge to remove threats to their young. Alligators are cold-bloodied reptiles and during cold weather times are often seen basking in the sun on the banks near ponds or other waters. They may also bask with their mouths wide open which is their natural way to control their temperature. If you do encounter such an alligator, making very loud noises can frighten them back into the water. You can learn more about nuisance alligators on the Louisiana Department of Wildlife and Fisheries website. How to Report a Nuisance Alligator. Anyone having concerns with a nuisance alligator situation can contact any Louisiana Department of Wildlife and Fisheries offices to make a complaint. You will be issued a nuisance alligator complaint number and given information for the nuisance alligator hunter covering that area. Here is a link to the LDWF’s Nuisance Alligator Contacts. The following are the ‘DOs and DON’Ts” for Living with Alligators in Louisiana as per the Louisiana Depart of Wildlife and Fisheries. Don’t- kill, harass, molest or attempt to move alligators. State law prohibits such actions, and the potential for being bitten or injured by a provoked alligator is high.